In that same 950 PRO review, don't miss Allyn's picture of all the current NVMe devices, laid out in speed order, thumbnail preview at right. Nice! If you like what Allyn and the guys are doing over at PC Perspective, you may also want to read about then subscribe to their amazing podcast, and consider supporting them at their Patreon page. You can see my pledge (bottom left). It's a fantastic PC hardware enthusiast site, and Allyn's magical work with IOMeter and many other tools is positively inspiring. Note that doing this M.2 RAIDing has some drawbacks, including the usual RAID0 risks, and the loss of the use of the SATA ports on the motherboard. Ouch! You may also have some loss of GPU bandwidth if you're a gamer using SLI. [I was incorrect, explanation below] Remember, it's all sharing lanes on that PCIe 3.0 bus. That said, it's all rather fun and interesting to read about: don't miss the great comments below Allyn's triple M.2 article! Unlike the pricier Xeon E5 family with the Intel C600 chipset, it appears the Xeon D-1500's Intel RSTe (Intel® Rapid Storage Technology enterprise) doesn't support RAID for NVMe. One example that I've just tested, based on the Intel Xeon D-1500, is the Supermicro X10SDV-TLN4F that's standard in the SYS-5028D-TN4T system. In RAID configuration, NVMe doesn't even show up, whether in Legacy (Ctrl+I) config, or in the UEFI BIOS-based config. This is true right up through the (about-to-be-released) BIOS 1.1. The only RAID of M.2 or PCIe SSDs that might work is when they're AHCI (SATA) based, such as the Samsung SM951. Not something I can test though, since I no longer have those drives, having found my happiness with the Samsung 950 PRO, as a part of my overall storage strategy. With the Samsung 950 Pro available, as well as the slew of other M.2 SSDs we saw at CES 2016, it’s safe to say that U.2 is going to push back into the enterprise sector, leaving M.2 as the choice for consumer motherboards moving forward. It was therefore only a matter of time before a triple-M.2 motherboard was launched, and that just recently happened - Behold the Gigabyte Z170X-SOC Force! 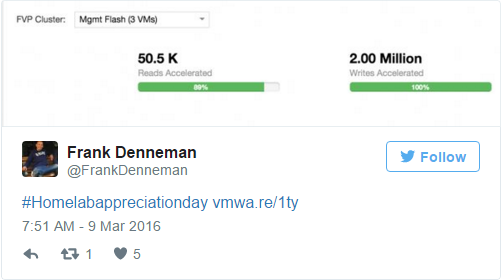 What about caching for your ESXi, using NVMe? See also Frank Denneman's latest teaser about FVP Enterprise, available as a 30 day trial. Anybody can grab and keep the read cache that PernixData FVP Freedom offers the home lab enthusiast, for free. Stay tuned for more about this! @paulbraren @pcper @vRobM Sweet, but no GPU hit on Z170 RAID - the NVMe devices are communicating via DMI. Only conflicts with SATA not PCI. All TinkerTry mentions of PC Perspective.